There are now two options when saving a job while in offline mode. Ready to sync and the newly added ‘Suspend’ option. 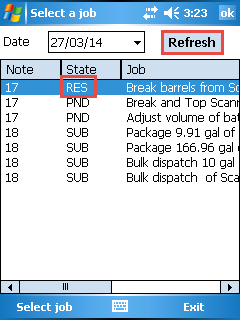 Suspending a job saves the information you’ve added on to the scanner device, which can be resumed at a later date. Selecting the job again allows you to resume from where you left off. Suspended Jobs will have their state set to ‘RES’ (resume) in the worklist. 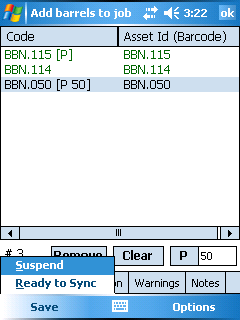 Otherwise, if you scan the work number of a job which is suspended you will notice that your saved information is already there, ready to be resumed. 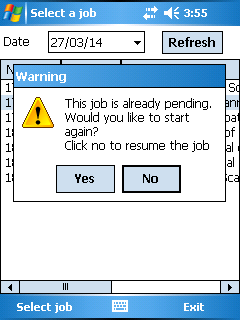 Clicking on a job which is pending will also allow you to resume the job if you want to make some last minute changes.